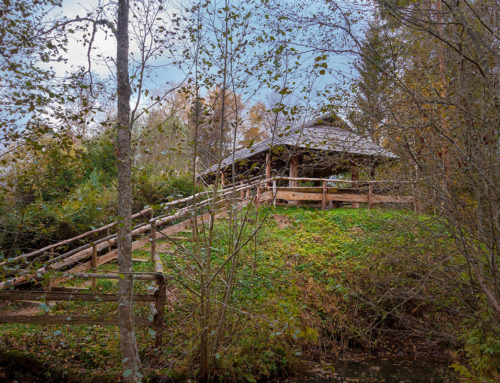 The Juniper Sauna is located in the forest (about 100 m from the main building), where visitors can relax in private surrounded by nature. 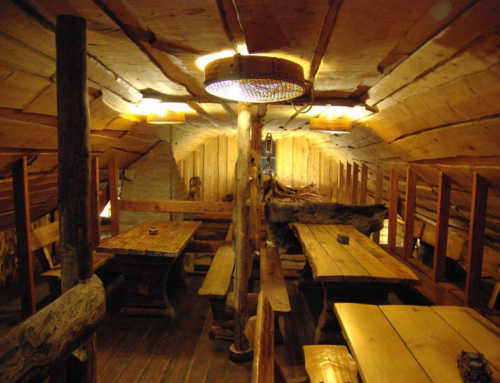 The anteroom of the Juniper Sauna can accommodate 14 people and the 2nd floor has beds for 10 people. The steam room can hold up to 4–5 people at a time and is permeated by the sweet scent of juniper wood. 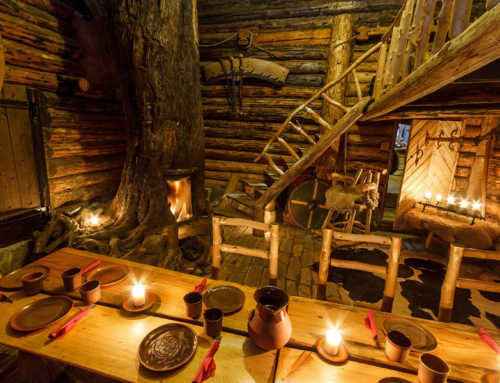 We will heat the sauna to 90–100 degrees Celsius for the agreed upon time and it can maintain this temperature for at least another four hours. There is a stereo system installed in the anteroom wall for playing music from CDs or USB devices. The room is also equipped with a sink and a kettle for barbecue prep work. 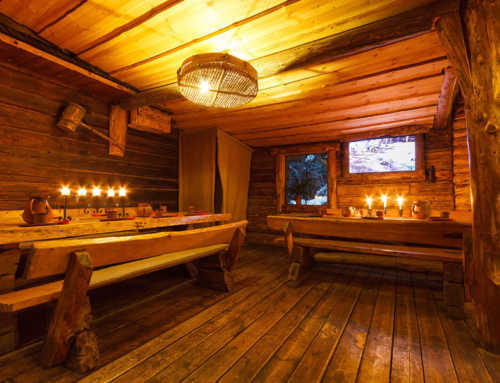 Behind the sauna, there is a roofed terrace with a table and benches, which is the perfect place to cool down, breathe in some fresh air and listen to the local songbirds after a round in the steam room. There is also a magnificent barrel hot tub reminiscent of the devil’s kettle behind the sauna, with multi-coloured lighting and a delightful bubble system. For longer sauna parties, we highly recommend ordering the hot tub to be heated up for you. During the colder months, the warm and bubbling barrel hot tub is incredibly relaxing. For the arrival of the guests, the hot tub is heated to 38 degrees Celsius. On hot summer days, we can also fill the tub with cold water for a lower price. Barbecue facilities are available beside the building. However, charcoal and utensils are not provided. Should you forget to bring your own, the necessary equipment can be rented or bought from the main Tavern building. If the party is too good to leave, feel free to stay the night. 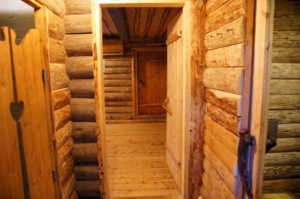 The 2nd floor of the Juniper Sauna has 4 rooms and a loft accessible by ladder. There is also a separate shower room on the 2nd floor. The Juniper Sauna has beds for up to 10 people. This is a relaxing place to spend the night so that you could start your journey home in the morning feeling fresh and well-rested.